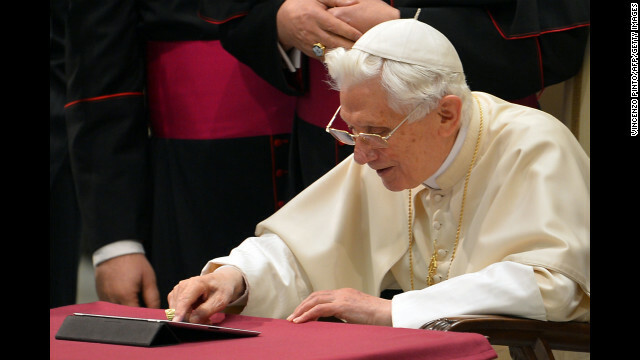 Pope Benedict XVI clicks on a tablet to send his first twitter message at the Paul VI hall at the Vatican, December 12, 2012. (CNN) - At the same time as Pope Benedict XVI leaves office on February 28, his Twitter presence as @Pontifex will also come to an end, according to Vatican Radio. The news may come as a sad blow to the more than 2 million people who've signed up to follow his tweets in nine languages since his account was launched with fanfare two-and-a-half months ago. About 1.5 million of those people follow the English language feed, with nearly 700,000 following him in Spanish and just short of 335,000 in Italian. About 22,500 people follow @Pontifex in Latin. The account will be closed to coincide with the 85-year-old pope's formal departure from office at 8 p.m. local time, Vatican Radio said. Too many people believe wars are Holy,or Jihads.Isaiah 2:4,in the Bible,says God ends all wars,if wars were Holy,or Jihads,God would not end all wars,God does not end what is Holy,God does not end what is of God.So all wars are not of God,as Isaiah 2:4,says God ends all wars,not just some wars,not just certain wars,but God ends all wars.And the Bible,a lot of which the Islamic religion is based upon,teaches that all life is precious and sacred to God,not just some life is precious and sacred to God,not just certain life is precious and sacred to God,but all life.The problem,and the trouble lies in most religious teachers don't teach all this,instead they teach you can kill evil in wars with guns and bombs,but the Bible teaches that such wars can't really kill evil,all people have souls and spirits,and all souls and spirits are eternal,either with God.or separated from God,so wars of guns and bombs can't kill them,and only God has the authority to accept or reject all souls and spirits. Ask; and it shall be given you; seek, and ye shall find (Matthew 7:7). Ask, and it shall be given you; seek, and ye shall find (Matthew 7:7). How does one become a member of a "communicate" ? The only desperate one here is you, AndyBandy.If you had any sense of honesty, you'd stop spamming your stupid crap here. You're a thief. Andy Berg's ego is too big for that Tom Tom, it's why they continue to spam here. They are the laughing stock of the internet but they're too dumb to get it. Their site is riddled with lies but in their warped mind they actually think they are telling the truth regardless of the constant facts given them proving their lies. Many of the people from these same institutions advocate against abortion, but don't understand the realistic benefit of the morning after pill or even basic contraception; their unrealistic wishful thinking is causing the death of many at the hands of disease. Realistically, many abortions could be avoided if a morning-after pill would not is not viewed as such an evil option. Many of these same people bring children into the world at a high pace, and then would prefer that the rest of society take over and educate their children in their particular brand of religion when they don't plan well and don't want to violate their silly beliefs. No it doesn't. You're deluded. And the irony is that said Twitter account was probably the reason he resigned as no doubt there were not many friendly comments in those millions of Tweets i.e the Arab Spring has turned into Religion's Spring. An examination of the 300 Prophecies of Jesus from the Jewish Scriptures.